Alan’s Factory Outlet is family owned and operated. We've been making online ordering easy and affordable for over 15 years. And we can help you find the perfect custom building for any need. All of our buildings are custom so you’ll first need to select your delivery area and your building options and we’ll confirm your pricing. You then only pay a small deposit to book delivery. Need more help? Call us or contact our experts here. We are one of the few, if not only, companies that offer a huge variety of carport / garage designs you can customize AND buy, all online. And if you need a little help over the phone we do that too! We are a family run business operating in the small town of Luray Virginia, situated in the beautiful, historical Shenandoah Valley. 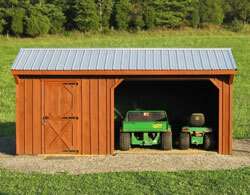 All of our buildings are custom made to order based on your specifications. All of our carport and metal garage prices include free delivery and installation in the 27 states that we service. All of our buildings are custom-made so select a delivery area first then your options and we’ll confirm your pricing.